The Concrete Pumping Association of Australia Inc. Concrete Pumping Association of Australia Inc Members and Committee originally developed the idea of a Pumpers Picnic in 2001. The idea was to showcase the latest products and share the latest techniques that may lead to a safer and more prosperous industry based on the idea ‘we can do together what we cannot do alone’. The Pumpers Expo & Picnic is the only organised function in the southern hemisphere that provides pump owners and suppliers with the opportunity to come together for the benefit of members and non-members alike. This year’s event was held at the Sydney International Dragway Eastern Creek, Western Sydney. The Annual General Meeting was held on Saturday 25th October 2014 at the Atura Hotel and was well attended with a strong interest in Committee Positions. The following nominated representatives were elected for 2014/15. 2014-2015 Management Committee President: Andrew Mitchell	Mitchcon Pty Ltd (VIC) Vice President: Matt Boyer	Rapidcrete Pty Ltd (VIC) Secretary: Peter Loveday	Coastwide Pumping Pty Ltd (NSW) Treasurer: Anthony Mattar	Belconnen Concrete Pty Ltd (ACT) David Bond	CPE Machinery Pty Ltd (VIC) Michael Wherritt	Kelveden Pty Ltd (NSW) Michael Keenan	Meales Concrete Pumping Pty Ltd (QLD) I wish to take this opportunity to thank the sponsors, exhibitors, advertisers, members and visitors who have contributed greatly to the success of the picnics, both past and present, in particular the previous and current Committee Members who have donated their time and effort to ensure the ongoing success of the Pumpers Expo & Picnic. I would like to thank Craig Heidrich CEO CPAA (HBM Group), Peter Loveday Secretary (Coastwide Pumping) and Pix Jonasson (Success Dynamics Group), for co-ordinating and organising this years Expo and Magazine. I would also like to thank Snap Printing (Port Macquarie) for graphic design and printing. President’s Welcome Message A year of significant change for the Concrete Pumping Association of Australia Inc. 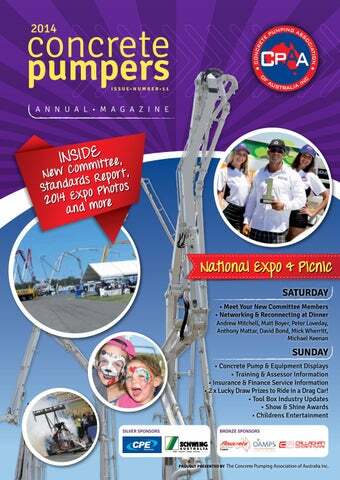 I trust you enjoy reading the 2014 Concrete Pumpers Annual Magazine and if you attended the Expo & Picnic, I trust you had an enjoyable day and were able to network with exhibitors and friends as well as update your industry knowledge. If you did not manage to attend, hopefully we will see you at the next one. Expo Quick Facts: 5 major sponsors, 5 exhibitors - up on last year, 173 attendees from 62 Companies In December 2013, the Management Committee appointed a professional industry association company, HBM Group, to manage the day-day business. Over time I hope you will have the opportunity to speak or meet our new CEO, Craig Heidrich, and his team. On Saturday 25th October 2014, just before the Expo, I reported at the AGM on some recent activities and achievements representing and arguing for our members’ interests which included: •	Re-activating the revision of Australian Standard 2550.15 and securing a voting seat on Standards ME-005 (main- committee). •	Development, approval and implementation of the Association’s 3 year Strategic Plan. •	Association Membership Database increased to include over 1,300 qualified concrete pumping related businesses across Australia. •	Consultation with Cement Concrete and Aggregates Australia – to ensure their new ‘Concrete Pump Delivery Guidelines’ did not overlap the responsibilities of the Concrete Pumping Industry. •	Consultation with Construction & Property Services Industry Skills Council (CPSISC) Reviewing High Risk Work License (HRWL) – to operate a concrete placing boom to ensure only one (1) HRWL license is need to for both mobile and tower boom operation. •	Regular monthly e-blasts to all members on topical industry issues. •	Publishing of the first Safety Bulletin regarding “Duty of Care”. Through your participation we can work together to simplify regulations and improve our skills, which will translate into safer and more profitability business. I encourage all members to speak with other concrete pumpers and urge them to consider joining and supporting the Concrete Pumping Association of Australia. We can achieve together what we cannot achieve alone. CEO Welcome to the Expo The Concrete Pumping Association of Australia is open for business With the appointment of HBM Group to manage the affairs of the Association, many of you may be aware that the Concrete Pumping Association of Australia (CPAA) announced earlier in 2014 that the Association is once again open for business. 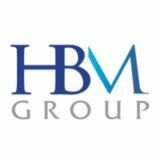 HBM Group manages a number of industry associations within the construction materials sectors and are well positioned to deliver on the Association’s aims and objectives of its members. As CEO of the CPAA, my team (Carol, Olivia and Aiden) welcome the opportunity and trust placed in our organisation. After a busy period taking responsibility for the day-day management of the Association, we have worked closely with the Association Board to finalise the new 3 year Strategic Plan. The Expo, being a central event on the concrete pumping industry calendar, is used to build the association profile and positioning as a valued and important part of the construction industry. To put this into some context, the recent membership survey member’s completed highlighted an industry which is widely misunderstood: •	There are approximately 1,300 concrete pumping related businesses operating across Australia responsible for providing time critical, dependable and safe concrete placing ability to both major and minor infrastructure. •	The industry employs some 12,000 people operating invested capital of $3.5 billion to deliver various materials (e.g. pre-mixed concrete) using a safe, reliable and efficient method each year. •	In Australia, the concrete pumping industry contributes approximately $1.5 billion of revenues into the economy and is an integral part of the construction materials industry contribution of $12 billion to GDP. The Concrete Pumping Association of Australia Inc was established in 1987 with the aim to develop and promote best practice and compliance in the concrete pumping industry. The Management Committee’s Strategic Plan will guide the Association with successive Committees to provide real value to all active members with a vision for a strong, unified and respected voice for the Concrete Pumping Industry across Australia. In other words ‘doing together what we could not do alone’. I trust that in time I will meet with many of you and get your views on how the Concrete Pumping Association of Australia Inc. can better engage your business to help raise the professionalism, profile and safe working practices of the concrete pumping industry; however we can only do this with your help. Welcome to Blacktown City My warm greetings to the organisers, participants and sponsors of The Concrete Pumping Association of Australia Inc (CPAA) 2014 National Expo & Picnic Weekend. I thank Mr Andrew Mitchell, President of CPAA and his organising team for selecting Sydney Dragway to host the Expo. This facility is one of the premier event sites in Blacktown City and attracts visitors from across the world. Blacktown City Council is the largest populated Council in New South Wales with over 325,000 residents (there are 2 million people across Western Sydney) and the latest Census data shows Blacktown City Gross Regional Product (GRP) estimated at $10.8 billion ($85 billion for Western Sydney). Blacktown City GRP has been growing 7.6% annually for the past 5 years. The size of Blacktown City’s economy alone makes it larger than 60 nations, as measured by United Nations. Infrastructure has been identified by all tiers of Government as the generator of future economic growth. The concrete pumping industry has over 1,300 businesses operating across Australia. The industry employs more than 12,000 people and is a vitally important part of the civil construction industry. The 2014 Expo gave participants, sponsors, delegates and government representatives a great opportunity to share ideas, develop valuable contacts and discuss key issues impacting on your industry with regulators and key decision makers. It is important that the industry delivers its materials using safe, reliable and efficient methods, treats its workforce with dignity and respect and meets consumer and government quality expectations. I wish all participants a successful and beneficial Expo and hope you develop some great contacts. I also hope you have the opportunity to enjoy a variety of the impressive attractions this City has to offer such as Wet n’ Wild and Featherdale Wildlife Park. (Major Inspections/Strip Down) The Concrete Pumping Association of Australia Inc (CPAA) represents the interests of all members across Australia. Committee Member, Anthony Mattar (Belconnen Concrete), is your nominated Australian Standards representative and Craig Heidrich (CPAA-CEO) is an authorised observer. We are very pleased to announce that recently the CPAA has, for the first time, secured a voting seat on ME-005 (MainCommittee). This is a significant achievement for our members and recognition of the Association’s continuing role in representing the Concrete Pumping industry. The Standards ME005-15 (Sub-Committee) is made up of industry stakeholders and experts, who have been working for over 5 years to update and align the current AS 2550.15 – 1994 with international best practice. Given some 20 years have now passed since the last review, it is now well overdue. The Association’s newly appointed CEO, Craig Heidrich, and I as your nominated representative to ME005-15 (Sub-Committee), recently met with Standards Australia to advocate for the importance of finalising this review. Currently, there are a number of unresolved matters and the Association has been requested to draft a response. At the time of writing this article, the Draft AS 2550.15 has still not been approved for release by ME005 (Main-Committee), be assured your Association is working very hard towards a resolution to provide greater clarity and certainty. Major Inspection and Assessment for Safe Use The current AS 2550.15 – 1994 stipulates that all concrete boom pumps must be stripped down. The CPAA position is that Pump owners/operators should comply with the requirements in AS 2550.15, along with manufacturer’s guidelines, and any State Code of Practice that exists. Be aware that Australian Standards are not a mandated legal requirement however you should also be aware that they can be used in legal proceedings where incidents and accidents occur. If an owner/operator chooses not to comply with the standard then they would need to be able to show evidence of what documents and steps they have taken to provide a safe working environment. See September Safety Bulletin-Duty of Care. http://www.cpassoc.com.au/education/publications/safety-bulletins A concrete pump owner/operator must consider a wide range of standards, manufacturer’s guidelines, safety bulletins, technical Act documents and obligations under National and State WHS Duties of Acts, Regulations and relevant Codes of Practice, workplace parties. see Image 1. Given the current misunderstandings, with what Regulations to do or not to do, the CPAA is now preparing Complement and support the a National Concrete Pumping Guidelines general duties as well as procedural and document, which, with the help of the administrative matters under the WHS Act. industry and regulatory authorities, will provide a nationally consistent Codes of Practice approach. Are practical guides to achieving the standards of health and safety required under the WHS Act and Regulation. Anthony Mattar Codes of Practice are admissible as evidence in court proceedings. Regulator guidance material, Australian Standards/Industry Standards, other WHS material Further guidance to assist compliance with the WHS legislation. To provide ‘state of knowledge’ along with codes or practice. SCHWING has been manufacturing the world’s 2014 most reliable, efﬁcient and economical CPAA concrete pumps for three generations. Sponsor We build our machines to stand the test of time so you spend less time under the pump. You can afford the SCHWING machine you’ve always wanted. Competitive pricing up front, underpinned by lower running costs and higher resale values combine to create unbeatable value. Show everyone you mean business – contact us today and step up into a ROCK SOLID SCHWING machine. cooling and settling of contaminants to reduce wear and extend service life of hydraulic components. including control blocks designed and machined in-house for the speciﬁc purpose of concrete pumping, optimise service life and ensure minimal pressure losses for more efﬁcient operation. SCHWING’s patented ROCK valve outperforms all others across a wider range of mixes, delivering you outstanding fuel economy. heights optimise ﬂexibility on the job. guide the boom, while pipeline routed along the neutral axis of each boom stage maximises boom service life and reduces R&M costs. The ROCK valve’s superior ﬂow path maximises wear life and minimises pressure losses, demanding less power to pump concrete, resulting in lower running costs. packages combine with reliable Roll Fold, Roll Z and Telescopic boom geometries to reach your job efﬁciently, inside and out. the main frame and then out to the ground via the outriggers. SCHWING’s large slew ring gear, anti-torsion frames and outriggers spread forces over a larger area thereby minimising stresses on steel and ensuring steady, smooth operation. stability and compact footprints get you closer to the pour on tight sites. “Swing out” rear outriggers are not necessary on the SCHWING S 36 X.
for efﬁcient operation and maintenance. and accessories with fold down sideboards, hose racks and lockable storage cabinets available. control systems are all within safe reach from ground level. practical options to optimise the safety, efﬁciency and economy of your concrete pumping operation. safety and working lights, rotary air compressor, High Pressure Cleaning System and Chamber Valve for easy cleanout, 360° rotating outlet for line pumping, End Hose Squeezer and lots more. awarded to Andrew Blasi, Lucky Draw Prize Drag Car Ride Blasi Building & Construction. Your Partner in the Concrete Pumping Industry Top quality, fully rebuilt and certified concrete pumps for a fraction of the price of brand new machines. At Global Beton Equipment we’re backing Australia’s concrete pumpers. We are a specialist in scouting top quality booms and pumps in the US and making these available for Australian customers. This gives you access to a national American fleet of more than 30,000 concrete pumps and placement booms. We select our pumps from owners that we know. We can strip them down and rebuild them ready for work the moment they arrive in Australia. We stand behind our customers with training, finance, technical support and assistance with regulatory permits. Global Beton Equipment, Inc is owned and operated by specialists in concrete pumping. We know the industry, we know concrete pumps and we stand behind our customers all the way. Our pumps deliver top productivity because they are designed and constructed with technology known and respected around the world. At Global Beton Equipment we help you focus on business instead of backcharges. We make top technology available at prices your cashflow can afford. Run your pump fleet with confidence and make customer complaints a thing of the past. 21M – ZX 4-STAGE $225,000 28M – ZX 4-STAGE $285,000 32M – ZX 4-STAGE $315,000 36M – ZX 4-STAGE $340,000 NEW truck mounted 36M – ZX 5-STAGE $360,000 boom pumps - includes 37M – ZX 5-STAGE $365,000 fitting to truck 40M – ZX 4-STAGE $370,000 Truck cost not included 41M – ZX 5-STAGE $380,000 Prices are plus GST 45M – ZX 5-STAGE $440,000 48M – ZX 5-STAGE $495,000 TWIN-WALL PIPE 50M – ZX 5-STAGE $520,000 SPECIALISTS All prices quoted are current as at time of publication. Right: Steven & Iliana Lo Iacono with Children Aurelio Ayelet & Eros. Below: Trish paying Adrian for coffee. Equipment Finance Interest Rates & Security - What Does it All Mean? When looking at finance alternatives ensure you are comparing the same amount financed, term, and residual values or balloon payment in dollar terms. Look at the monthly repayment and make sure it relates to the Interest Rate quoted. There are a number of factors that impact interest rates when borrowing i.e. • Net Worth of Borrower/guarantors • Security • Profitability • Inherent Equipment Values • Understanding of Industry to which they are lending Concrete pumping companies often complain that when banks arrange financing for capital equipment they fail to take into consideration the value of the equipment to be financed. Many of these concrete companies remain with their banks despite the fact that a substantial percentage of the approvals are not competitive in cost, structure, or security required. Nor do they respond in a timely manner to owners needs. Capital equipment finance facilities are best done on an unsecured basis (the security for the loan simply being the machinery itself) with the guarantee of the company principals. In many cases, financing is done without company principals clearly understanding the “all monies” or “cross collateralisation” clauses within the loan documents. Simply put, “cross collateralisation” deeds mean that all debt is secured by all security held. Double securing is fine if the company does not require its “bricks and mortar” assets for other purposes. However, in the current economic climate, many companies expect significant growth in the next four years, should save that bricks and mortar security for more appropriate requirements, such as: • Increased working capital facilities • Property funding Concrete Pumping companies may be better off placing capital equipment finance requirements with another banks or an independent broker. m and Line pumps. They Log Books are available for both Boo operators to maintain are designed to enable owners and accordance with the their machines and their records in e. current Standards and Code of Practic ilable so that the white An Office Copy Logbook is also ava Logbook can be filed in copy of each page from the Pumps the office for safe keeping. The Association has top-quality long-lasting safety stickers available for purchase. Members save approximately 20%. The Boom Pump kit includes 43 stickers. The Line Pump kit includes 11 stickers. Detailed instructions are included in each kit as to where to place the stickers on plant. WARNING! Collision/falling hazard! Before driving on bridge or elevated roadways, be sure that they can support the weight of the vehicle (Figure 9). Minimum of 8 metres clearance from wires. Keep your re 53 body out of the mac parts hine placement method. This LARGE sticker is supplied as part of the Membership Kit when joining the Association Inc. and after membership paym ent has been received. The NEW Concrete Pumping Association of Australia (CPAA) website will provide a ‘one-stop-shop’ for concrete pumping members and industry stakeholders with easy access to technical and educational information, membership renewal and a streamlined online store for the ordering of safety products and prompt delivery. This long awaited modernisation of the Association website represents a major investment and commitment to improving services for members of the concrete pumping industry. The website will also be mobile device compatible for remote job site access. Your National Management Committee approved the Association’s Strategic Plan in May 2013, with this Major Website Upgrade representing a large-scale project. Over the coming year, further enhancements with new safety related products and services are planned for release. The CPAA seeks to provide a strong, unified and respected voice for the concrete pumping industry across Australia in working to improve the professionalism, safety, standards and performance of the industry it represents. Our mission is to improve the standing of the industry by informing and educating our members through the provision of valuable advice as well as relevant products and services. Membership Categories Concrete Pumping Contractor (Full Member) A company registered to trade in Australia who owns or leases concrete pumping equipment for the purpose of placing concrete. This type of member has full voting rights. Manufacturer & Suppliers of Pumping Equipment (Full Member) A company registered to trade in Australia who manufactures or markets concrete pumping equipment for the purpose of placing concrete. This type of member has full voting rights. Concrete Pump Inspector & or Operator Trainer (Full Member) A company registered to trade in Australia who has acceptable qualifications to inspect and assess the condition of a concrete pump and report to the owner the recommended repairs required to comply with all the Safety Standards and Regulations or has the qualifications to carry out concrete pump operator training and assessment in preparation for operator certification. This type of member has full voting rights. Supplier of Services to Concrete Pumping Industry (Associate Member) A company who provides services to the concrete pumping industry in any form. e.g. Concrete mix, insurance, raw materials, tyres, advertising, management advisers etc. This type of member does not have voting rights. The Concrete Pumping Association of Australia Inc. (CPAA) is recognised by many organisations that affect the industry such as WorkCover, Environmental Protection Authorities and Standards Australia. Benefits of membership • Nominate up to 3 representatives to receive information circulars. • Voting rights w/ right to nominate to National Management Committee. • Complimentary copy of Concrete Pumpers Annual Magazine. • Free access to CPAA National Expo & Picnic. • Discounts on all products, including Logbooks, Safety Stickers and Safety Manuals. • Discounts on sponsorship and exhibition at CPAA National Expo & Picnic Weekend. • Use of Association logo on company promotional material (e.g. website, vehicles etc). • Weblink on Association website. • Access to e-blast notifications and special circulars related to safety alerts. • Access to e-blast advertising. • Increased professional credibility.